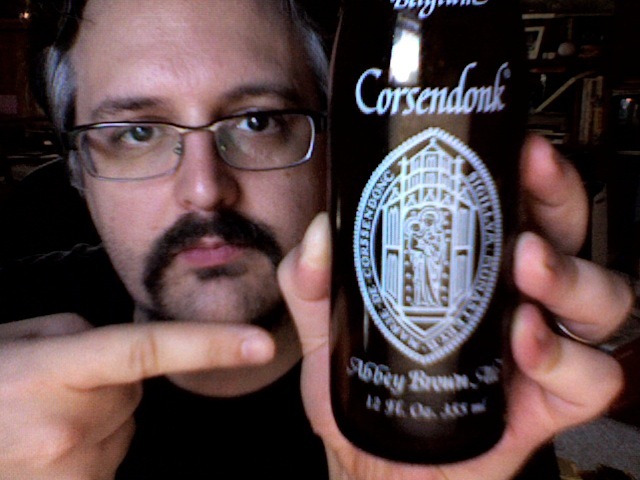 A Belgian dubbel style beer, the Corsendonk is smoky but not overly bitter. This is a yeasty, barley-ish beer with a fruity fragrance and a slightly subtle body, reminiscent of raisins or currants. The label states it will mature in bottle, becoming softer and smoother. The bottle that I drank has a “best enjoyed by” date of June 2009, yet it’s still pretty soft and smooth. I think after another year, there may have been nothing left to it. It pours as a nice dark amber color with a medium, foamy head. I don’t have a lot of experience with Belgian beers, but this one strikes me as beginner-friendly—not overly complex, not too hoppy, just a bit of smoke that lingers on the tongue. It’s a decent beer with not a lot of zing. I picture enjoying it on a winter’s night, but I’m not sure if this would make it into my regular rotation.